Nu Skin (NUS) is a somewhat speculative study but displays some promising characteristics. I’m reminded of Laura Berkowitz’s timeless “Confessions of a SafeSkin Buyer” published years ago in Better Investing and wonder if the study shouldn’t include a threats and opportunities analysis of single-product companies, fads … and the like. Gentex (GNTX) is a potential study in conflicted consensus. Morningstar thinks the price-to-fair value ratio for GNTX is 74% (attractive). S&P thinks the P/FV is 103% (fairly/fully valued). Go ahead. Rumble. What do you think? Walgreen (WAG) and CVS Caremark (CVS) continue their leadership campaign and compete with each other. Both companies remain attractive from a return perspective and the fundamentals at CVS have strengthened of late — now topping WAG in the quality ranking. S&P sees opportunity with a P/FV of 74% for CVS. 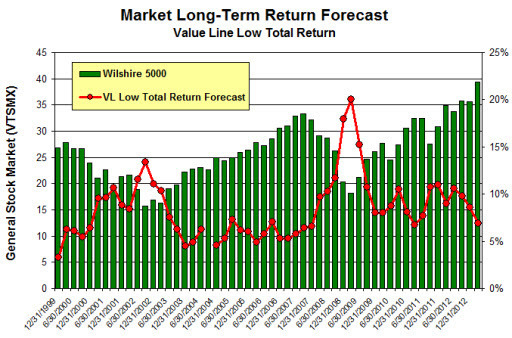 The Value Line median low total return forecast is 6.8%, down slightly from last week’s 6.9%.